By the time they are five years old; children should be eating a similar diet to the rest of the family and joining in with family meals. But as they’re still growing, they may need a few extras to ensure they get enough energy. Research shows that many children go off to school without eating a good breakfast or grab a chocolate bar instead. Most families are in a hurry in the mornings, but a bowl of fortified cereal with milk and a glass of fruit juice takes no time at all to prepare and eat. Alternatively, a couple of slices of wholemeal toast and spread with a banana and a glass of milk will provide an energy-rich start to the day. Children are much more likely to concentrate at school if they’ve had something good to eat first. If children have a school lunch, parents can chat with them about healthy choices – although peers may have an increasing influence at this stage. Some schools send out menus in advance, which children and parents can look at together. If children have a packed lunch, parents can still monitor what they eat and many schools make it easier by banning things like crisps and chocolate bars. Try to include a balanced selection such as a sandwich, samosa or filled pitta, some fresh or dried fruit, raw vegetables like carrot sticks or cherry tomatoes and a yoghurt or a piece of cheese. 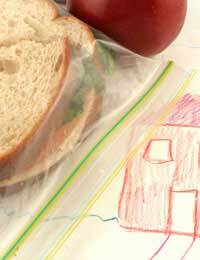 Children often need snacks during the day to keep going. Avoid keeping too many biscuits, cakes and crisps in the cupboards and stock them instead with crackers, bread sticks and dips, plenty of fruit (children love fruit that’s easy to eat, like grapes, strawberries, dried apricots and raisins) and raw vegetables. Other good snack ideas include breakfast cereal and milk; baked beans, cheese or peanut butter on toast; yoghurt; and home-made smoothies. Keep sugary drinks to a minimum because of the large amount of sugar they contain. The diet varieties have lots of artificial ingredients too, so are best avoided. If children want fizzy drinks, try sparkling water with fruit juice or a little high juice squash. Milk and water are good drinks at any time of day, but avoid filling up on milk before meals. Children over the age of two no longer need full fat milk. Some parents give their children vitamin supplements. Most experts agree that this is unnecessary if children are eating a balanced diet. If parents try to please everyone, they can end up running a café at home. Try to strike a balance between acknowledging that everyone is an individual – with their own likes and dislikes – and a certain level of cooperation over eating healthy food. There are some simple strategies that will help. For example, if one child prefers their pasta plain, put some to one side before adding sauce. Or if they only like one or two vegetables, buy in frozen ones that can be cooked with a minimum of fuss – but don’t deprive everyone else of variety. Let children help choose healthy menus and get them involved in shopping and cooking – that way, they’re more likely to feel consulted. Do serve foods that children will like, but offer new tastes too and praise them for trying. It’s best not to force children to eat what’s on their plates, but don’t offer too many alternatives either or let them fill up on puddings.